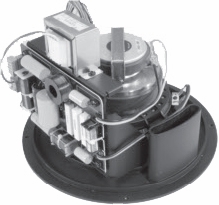 JBL Control 328CT Ceiling Loudspeaker DJParts - All Variety of Parts that DJ Needs.  Consistent 120° broadband pattern control covers an extremely large area.  Shaped mounting baffle provides the pattern control of a 300 mm (12 in) horn from a 200 mm (8 in) driver.  Components • 200 mm (8 in) woofer with Kevlarreinforced cone and 50 mm (2 in) voice-coil.  • 25 mm (1" exit) compression driver.  250 Watt power handling with very high sensitivity provides high SPL capability. Control 328C and Control 328CT have been engineered from the ground up to deliver exceptional next-generation performance in a coaxial point source design ceiling loudspeaker. The combination of the low frequency cone and the shaped mounting baffle performs as a true 12 inch (300 mm) diameter waveguide for the high frequencies. A unique metal throat transitions seemlessly to the horn to eliminate high frequency beaming which is common among this category of speaker. The result is a coaxial speaker with wide, extremely consistent 120° coverage on a broadband basis. Component features include a Kevlarreinforced low frequency cone for reliability, well-damped surround for smooth frequency response, high temperature voicecoil and a reduced distortion design through saturated-gap magnet geometry. The high frequency driver features a pure titanium diaphragm for high sensitivity and long life, with diamond surround for resonance control and FerroFluid™ for increased power handling. The Control 328C and Control 328CT are easy to install. The removable multi-pin locking connector, with secure screw-down terminals, allows for pre-wiring the input wires for easy clip-on convenience during installation. The clean, contemporary look of the optional MTC-RG6/8 round grille is designed to suit high-end venues, offering a simple, elegant appearance that fits into a wide variety of décors. The optional MTC-300BB8 one cubic foot backcan is made of extra-thick 16 gauge steel and the top is lined with ½” medium density fiberboard. The transformer version Control 328CT comes with a pre-attached top quality, low saturation 68 Watt multi-tap transformer for 70V/100V distributed speaker lines. To ensure long life and reliability, Control 328C/CT passes JBL’s 100-hour torture power test, the toughest standard in the industry. Crossover Network: 1.9 kHz, 3rd order (18 dB/oct) high-pass plus conjugate to HF, 2nd order low-pass to LF. Physical: Input Connector (328C): Removable locking connector with screw-down terminals. Max wire 12 AWG (2.5 mm2) 328C: 1) + in, 2) + loop out, 3) – loop out, 4) – in Tap Connection (328CT): 328CT: A) Common B) 8.5W@70V, 17W@100V C) 17W@70V, 34W@100V D) 34W@70V, 68W@100V E) 68W@70V, n/c@100V Safety Agency Rating: Suitable for use in air handling spaces, per U.L. -2043, U.L. 1480, NFPA90 & NFPA70A. In accordance with IEC60849 / EN60849, Transformer in CT model UL Listed per UL1876. Baffle: Metal, round, 305 mm (12.0 in) diamter, driver premounted to baffle, ported. Baffle Attachment to MTC-300BB8 Backbox: Attach via 4 #10 x .75 in (19 mm) sheet metal screws. Grille Attachment to Baffle: 4 pcs 4 mm machine screws. Dimensions (H x W x D): 305 mm (12.0 in) diameter round baffle x depth from back of baffle of 160 mm (6.3in) on 328C & 218 mm (8.6 in) on 328CT. Net Weight: 328C: 4.5 kg (10.0 lbs) 328CT: 5.4 kg (12.0 lbs) Shipping Weight: 328C: 5.8 kg (12.7 lbs) 328CT: 6.7 kg (14.7 lbs) Included Accessories: Ported baffle pre-attached, plus transformer on 328CT. Optional Accessories: MTC-RG6/8 Grille, round contoured, white. MTC-300BB8 Backbox, 25 liters (1 cubic feet) MTC-300T150 Transformer, 150 W for use with 328C. 1 In half space (in ceiling) 2 Average 1 kHz to 10 kHz 3 IEC standard, full bandwidth pink noise with 6 dB crest factor. 4 Measured in half space (in ceiling), ave 100 Hz – 10 kHz. 5 Measured in full space with 6 dB added for half-space calculation. Method used by some European manufacturers, for comparison purposes. 6 Calculated based on power rating and measured half-space sensitivity, exclusive of power compression. JBL continually engages in research related to product improvement. Changes introduced into existing products without notice are an expression of that philosophy.